"Making small sculptures is a way of drawing for me. In this small scale I can work quickly, enabling me to uncover those spontaneous relationships that both amuse and intrigue me. It is a way to understand the elements, the cause and effect of the physical relationships. The pieces are not pre-conceived. This is the quality which attracts me to drawing." "Working in a series, I tend to simplify. I like to keep the variables to a minimum. Rather than erase or paint over, I start again to see what might happen differently. It is analytical, but only to a degree. There is also a small violence in this process- the block of wood is gutted and the insides are cut out. From the 'guts' a new object is created: either rebuilt as it was in nature or reconfigured as something new." Mel Kendrick's dense but lithesome "drawings" are wooden sculptures mostly less than a foot tall. 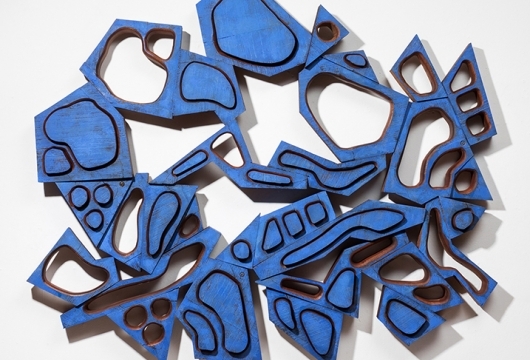 They are made of sections of wood that have been coarsely cut and juxtaposed. Like Kendrick's larger works, these sculptures become animated as one moves around them, changing profile and shape in a dance-like flow. Their confident stance and symmetry recall monumental sculpture, while at the same time, the demarcations of their construction invite a translation into line, their dimensions repressed. Either way they are regarded, each work is a chunk of dynamism and visual complexity. Mel Kendrick was born in 1949. This is the first time his work has been exhibited at Nolan/Eckman. Mel Kendrick: Drawings in Wood will run simultaneously with our exhibition Mbuti Design: Bark Paintings by Pygmy Women of the Ituri Forest.